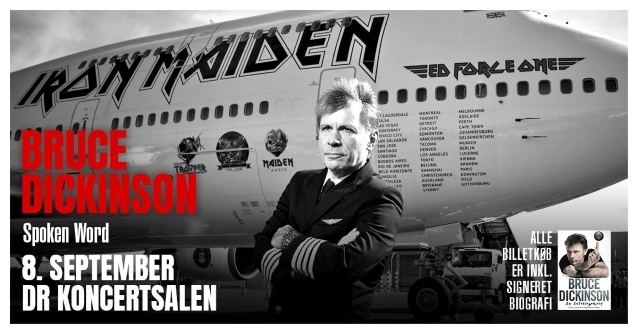 On the back of his recently released autobiography, “What Does This Button Do?”, IRON MAIDEN frontman Bruce Dickinson is making a string of speaking appearances. On the tour, Dickinson is reading excerpts from his book, delivering slides and hosting a question-and-answer session in which fans can ask all the questions they have been dying to know about what it’s like to front one of music’s most iconic bands. “What Does This Button Do?”, landed at No. 10 on the New York Times “Hardcover Nonfiction” best sellers list. It was released in the U.S. last October via Dey Street Books (formerly It Books), an imprint of HarperCollins Publishers. Dickinson joined IRON MAIDEN in 1981, replacing Paul Di’Anno, and made his recording debut with the band on the 1982 album “The Number Of The Beast”. He quit the band in 1993, pursuing several solo projects, and rejoined in 1999.